Unfortunately the barn is laying in a pile of debris. I am linking to Tom's Barn Collective. Not much of that barn left. It is a huge one, must be difficult to fill it up. Great photo! The cloudy sky is a perfect background for the sad rubble of the barn. Glad the silo is still standing tall and proud! The silo was built to last! Welcome back! ...Silos are often all that remains on some abandoned farms in this area. The value of concrete! Thanks Andy for joining the Barn Collective, it's nice to have you here. How long do you think that silo will last? Btw....thanks for pointing out my very Freudian typo. I fixed it so future readers won't have to decipher what I mean. You wonder how long that silo will stand. The silo was built to last. The barn must have been in pretty bad condition to collapse in to a pile. El silo cumplio su funcion durante mucho tiempo y ahora queda para ser inmortalizado con la fotografía. 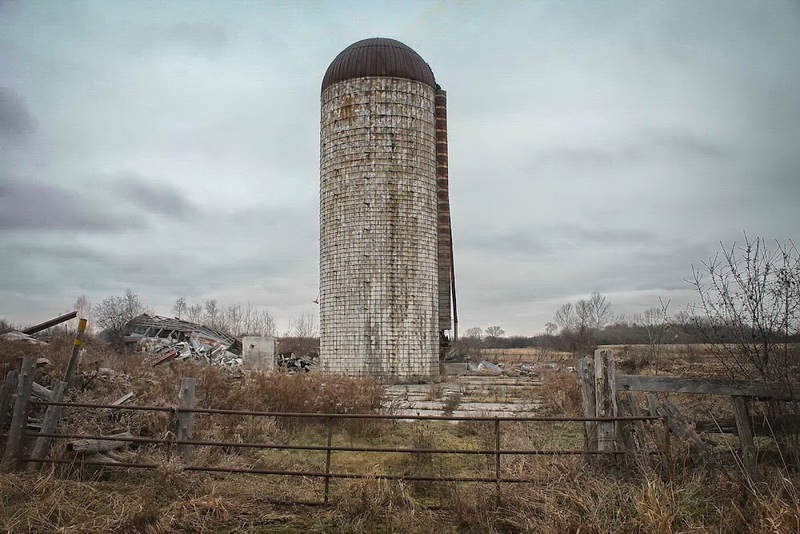 I imagine the silo on the farm where I grew up is much the same, or even a pile of rubble by now. Great photo. Just over from "Occasional Toronto". Enjoy your post. Served it's purpose it seems. We've had barns collapse into heaps here, too. I guess barn construction isn't meant to last through the ages. Shame the barn is gone but that is neat silo!